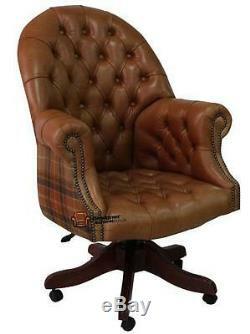 Chesterfield Directors Swivel Office Chair Old English Tan Leather+Caramel Wool. H ANDCRAFTED IN E NGLAND. Chesterfield Office Directors Swivel Chair. Old English Tan Leather + Caramel Leather. The Classic Chesterfield Directors Leather And Wool Office Chair. Deep buttoned back and seat. The upholstered arms are attractively embellished with lines of individual stud nails in Hard Wood. An undoubted winner in any room from the cottage to the boardroom. A true classic of its kind. What Is Old English Leather? Old English is aniline leather, tanned to ensure a pleasing distressed or aged finish from new. Extra fat liquors are applied during tanning, to give the leather a slightly waxy feel. These leathers are designed to allow the natural marking variations of the leather to show through to the finish coat. Pull-up leathers do not have a consistent colour density across the whole hide. They are designed to change colour and sheen when pulled or stretched. They are not as colour fast as pigmented hides and are designed to allow furniture to age and relax through use and over time. Furniture should be protected from direct sunlight and not placed next to radiators. Evidence of marks and scarring will be seen through the surface finish. Each hide will be unique, and so will the furniture on which it is used. Non Tropical Screwed And Glued Hardwood Frame Made In House. From Construction Of The Wooden Frame To Filling In the Cushions all is completed In house (please visit). Pay For Your Order In Full Upfront. We understand that purchasing furniture is a household decision. Therefore in order to make this stress free, we offer all our customers. Free swatches to help decide on colours. Free impartial advice on the suitability of products. Free measuring service / advice. Manufacture Bespoke Items to fit the space you have available. Chesterfield House, Forrest Street, Blackburn, Lancashire, BB1 3BB. The Colours in the photo image are as accurate as possible within the tolerances of the desktop screen. Please therefore ensure you request one of our free leather samples. When orders are placed online they are automatically confirmed. The item "Chesterfield Directors Swivel Office Chair Vintage Tan Leather+Caramel Wool" is in sale since Thursday, June 30, 2016. This item is in the category "Home, Furniture & DIY\Furniture\Sofas, Armchairs & Suites\Armchairs".